Shown here is the stand with handles printed in a different pattern from the Sydenham Series. This ironstone sauce tureen without handles printed in blue with a Sydenham Series pattern was found among some 800 sherds from a variety of vessels in the Sydenham Series pattern in both blue and brown that have been recovered at the historic Warner archaeological site in Livingston County, Michigan. It had been curated by six generations of the Warner family for over 150 years. The printed mark on this piece includes the name Davenport Brothers. While the company was in business from 1844-1875, they are first known to be at the address of 203 Greenwich St., NY--included in this mark and the one above-- from 1854-1875, which suggests that the earliest date that they would have imported Sydenham would be 1854. 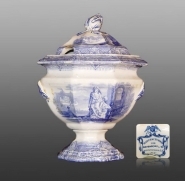 An ironstone covered tureen with stand printed in blue in a pattern from the Sydenham Series. Patterns in this series feature an imaginary landscape that includes classical statues, usually with a lake, distant classical buildings and clouds intended to complete the scene. The series is known printed in blue, green, purple, brown as well as in flow mulberry. The real Sydenham began as a small English settlement that became famous in the 1640s, when springs of water were found to have medicinal properties, attracting crowds of people to the area. In 1852, the directors of the Railway moved the Crystal Palace, originally built in Hyde Park for the Great Exhibition of 1851, to Sydenham, putting it in its own setting, complete with pleasure gardens and pools. Sydenham is now more or less incorporated into the city of London. This series was imported by the American retailer Davenport Bros., 203 Greenwich St., NY. 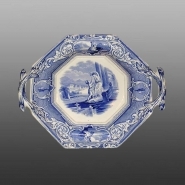 An example from the series was discovered on sherds in an archaeological dig in USA by one of the Transferware Collectors Club archaeologist members. See the example below.